Personalized pens and pencils are a great way for people to remember you. Personalized pens and pencils are a great way for people to remember you. 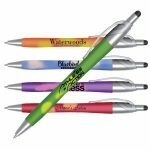 Whether you choose a personalized click pen, the old-fashioned stick pen, a more stylish stylus or a pencil, we offer great prices, making this an economical way to advertise. Personalized pens and pencils are available for full-color custom imprint. Contact us for pricing. Custom printed pens and pencils make your advertising idea perfect. You can also purchase them blank. 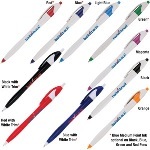 Use personalized pens and pencils for any occasion or promotional use. All our pens and pencils are imprinted in the USA. We offer many styles, designs and colors. 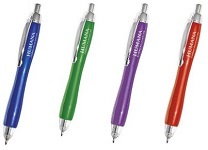 Personalized Pens – Many styles of pens that you can personalize, including our Mood Pens. Light Up Pens – Selection of fine pens that light up. Great for law enforcement agencies, restaurants, truck drivers and other heavy equipment operators who need to write things in dark places. Promotional Stick and Click Pens– Be sure to check out more of our promotional pens – many on sale! Custom Printed Click Pens– Many more click pens with sale prices. Stylus Pens – Multi-function pens that also have a stylus tip making navigation and typing on touch screen devices easier and keeps screens fingerprint-free. Promotional Pencils – Print your custom message on any of these pencils. 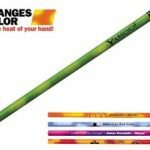 Mood Pencils – Many different styles of pencils that change colors with the heat of your hand. 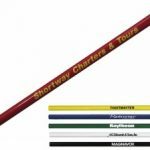 Personalized Pencils – Pencil designs that allow area for your custom imprint. Patriotic Pencils – Predesigned patriotic-themed pencils. Christian Pencils – Predesigned pencils great for Sunday School and Vacation Bible School. School Pencils – Cool pencil designs for grade school and middle school. Jumbo Pencils – Big pencils for little hands/little projects and big hands/big projects. Personalized pens and pencils are a favorite to hand out.